An unidentified Class 25 heads south with the 8V12 Washwood Heath - Reading, the motive power provided of course by Saltley. For a large view of the above shot click here. This view was taken sometime during the summer of 1975 when the author (and as a matter of fact your webmaster also) were busy studying for their A Levels, and the lineside seemed as good a place as any to do this. The photograph is taken near Bishops Itchington - access was via a farmer's road that passed under the railway by means of the bridge in the foreground. Nearby was a pw hut, the roof of which made a fine observation platform to catch the trains in between the studying! Leamington would probably not be considered a place high on one's list to visit in order to see Class 24 & 25's in action, either on passenger or freight workings. However the close proximity to Birmingham and the depots of Bescot and Saltley with its allocations of the Type 2's would find many diagrammed for turns over the former Great Western mainline. Many from the Nottingham Division would also pass through on a variety of workings. In addition to the Type 2's the line was of course very familiar with the Class 47's on the Paddington services and the cross country workings via Reading. Peaks were also frequent visitors to the line, on quite a variety of workings. All notes and views provided by Andy Hoare unless otherwise stated. As usual this is a work-in-progress so updates will occur as time permits. I do not know which were the first diesels to work over the Birmingham - Banbury route, but probably the first Sulzer powered locomotive would have been one of the dozen narrow gauge machines built for service in Australia. These test runs took place between Smethwick, Birmingham & Banbury, using two of the four standard gauge bogies built for the class. The first locomotive was destined for the Central section & was therefore air brake equipped, this required the use of an ex-LNER quintuple articulated suburban set, a specially piped new BR saloon was provided for guests and observers. Maximum load was 360 tons trailing. The test run from Banbury to Birmingham Snow Hill on February 25th 1954 ran with a load of 250 tons trailing. The 45.75 miles was covered in 80 minutes, maximum speed was 50mph, with half a dozen 20mph restrictions through certain stations due to restricted clearances. And possibly similar locomotives destined for Sierra Leone may have travelled this route under test. Not quite sure where this view is but its almost certainly the first Sulzer powered locomotive to travel the route through Leamington Spa. This locomotive carries an earlier version of the 6LDA28 engine which would power the Class 24/25's along this route. For the NSU Class the verdant green landscape of central England would give way to a long sea voyage followed by a lifetime of service in the hot, dry central section of Australia. Another machine to come out of the BRCW workshops at Smethwick was D0260 Lion which would also travel through Leamington onm a variety of workings. During 1962 it was loaned to the WR at Wolverhampton - Stafford Road (84A) shed from May until September. It was noted working trials between Wolverhampton & Shrewsbury prior to working May 14th's 7.25am Wolverhampton - Paddington and return 12.10pm Birkenhead as far as Wolverhampton, then the 3.35pm to Paddington and return 7.10pm to Shrewsbury as far as Wolverhampton. On May 17th it failed on the last turn at Harbury and did not work the following day’s turns. After a long spell out of use at Smethwick D0260 Lion ventured out during early April for testing on twenty coach trains between Leamington & Birmingham. D0260 would of course not be long for this world, but its place would soon be taken by a large fleet of Class 47's, many of which would be routinely used on services through Leamington. During June Derby allocated Class 45 D123 was used for crew training on local Solihull & Leamington services. Visitors to the route during the summer included Hither Green allocated BRCW Type 3's on scheduled services from the South coast. On August 8th D6518 was in charge of the 10.27 Brighton - Wolverhampton, and D6516 on the 08.45 Margate - Wolverhampton. The second week of February found D5281 on crew training between Burton & Banbury. Six passenger coaches and a brake van were used as a load. Freight on the Derby – Birmingham line was at this time evenly split between steam & diesel haulage. 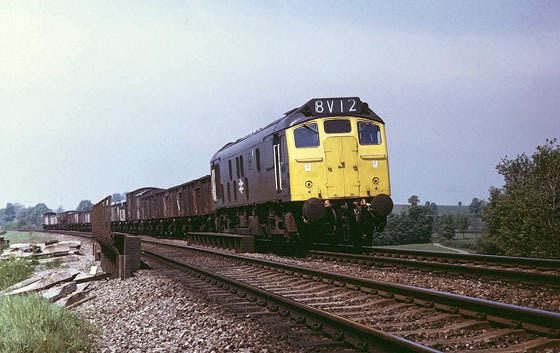 However by mid-February the Banbury – Burton –Toton freights were dieselised using Peaks or pairs of Class 25’s. These freights were used to incorporate the local workings from Nuneaton shed, allowing closure of that shed (on June 6th) and withdrawal of its few remaining steam engines. Saltley Type 2’s were now used as bankers between Landore Street and Camp Hill, replacing the BR Standard’s which had only recently taken over from the ex Midland 0-6-0’s on this duty! Although not un-common to Banbury a regular double headed Type 2 working was initiated between there and Burton to handle the recently diverted, ex Great Central, Middlesborough - Banbury freights, with many of the latest outshopped Class 25’s being found on this service. Another Type 2, this time from Rugby shed had charge of a new oil tank service from Warwick to Immingham, as far as Burton. Whilst most will remember the Class 25's on this route, it must not be forgotten that the BRCW Type 2's (Class 27's), when allocated to the Nottingham Division, were virtually interchangeable with the Class 25's on the freights to Banbury. When Banbury shed closed on October 3rd the passenger pilot at Banbury reverted to a Type 2, with D7591 initially used. After a short while the duty fell to the more common Class 08 shunter. The timetable alterations of March 6th brought major service changes in a number of areas. Most dramatic was the end of through services between Paddington & Birkenhead, a casualty amongst other things of the LMR electrification. Until about 1969 a Tyseley allocated Class 08 shunter was out-stationed at Leamington Spa to handle several duties. This was replaced by a Class 25. This would work coal trains to the local coal depot and the Ford works just north of the station. When not in use the locomotive would be stabled in the station sidings. This duty would disappear sometime roundabout 1975. The opening of Didcot Power Station in 1968 meant new coal traffic flows for the line through Leamington and Banbury. When Class 47's were used on the loaded southbound mgr workings to Didcot the working was booked for pairs of Class 47's from Washwood Heath to Banbury since most of this route was uphill except for Hatton Bank and a short stretch of track between Leamington Spa & Banbury. Once at Banbury the assisting Class 47 would be removed and return north light engine. During 1970 a miners dispute led to the large stockpile of coal at Didcot being taken northwards for use at a number of Midland area power stations. These trains were generally worked by pairs of Class 20's, and during this period a Class 25 was provided at Leamington Spa to assist the northbound workings up Hatton Bank, frequently the bank was topped at 10-15 mph, if the train were required to access the loop at the foot of the bank even more sound was produced by the hardworking locomotives. Later pairs of 20's would take over banking for these trains. 25084 at St Andrews Junction lends its weight banking a Didcot bound MGR during 1982. One can but imagine just how the engine exhaust sounded as it bounced off the underside of the overbridge. Four additional coal trains ran daily between September 1st & 5th from Coventry colliery utilising Toton allocated Peaks, the London train worked to Nuneaton and the three to Immingham as far as Beeston. Banbury borrowed Class 45 No.75 for crew training during September. A new contract to move pipes from Leith Docks to several long distance locations including Derby, Wisbech and Salisbury, and shorter hauls to Carlisle, Darlington, Law Jct, Maud & Montrose would provide much work for pairs of Haymarket Class 25’s. The Leith – Salisbury diagram involved the Scottish Type 2’s working as far as Didcot, examples noted were 25011 & 25026 (March 13th) and 25002 & 25317 (March 27th), 25018 & 25031 (April 10th), 25026 & 25092 (April 24th), the locomotives generally returning north light, at least as far as the Birmingham area. An engineer’s special hauled by 25068 & 25072 ran on June 3rd from Walsall to Willesden via Tyseley & Banbury, included in the formation was a track recording coach. Date unknown - an empty northbound train of 42 empty HAA mgr wagons was worked from Didcot to the Midlands when the booked power, a Class 56 failed. If the train were routed via Solihull it would have been challenged by Hatton Bank, unless it went via Coventry. February 26th found 25202 & 45044 heading a down oil train through Leamington. Northbound with a breakdown train. Southbound with a truly mixed freight. The day to day routine of this line was like that of any other, for the vast majority of the time all that was supposed to happen did happen - the events listed below are samples of when things didn't quite go to plan for some workings on this route. For example some workings would just appear to be routine, but as events took place the locomotives and frequently the crew would end up beyond their normal diagrams. For instance on November 11th 1969 Class 25's 5246 & 7504 were in charge of a 22.00 Narborough - Hamworthy special, instead of being replaced before reaching SR metals they worked as far as Eastleigh, thence returning light to Banbury, where they were procured to work the 12.10 Banbury - Reading West and 14.50 return, the last working regularly featured Cl 25’s. Another example of the Class 25's boldly going where they weren't really supposed to occurred on June 29th 1971 when 5242 & 7598 worked the 02.29 Toton - Eastleigh throughout, the normal exchange of power at Banbury did not occur as there were no replacements available. The Sulzers returned on the 14.30 Eastleigh - Washwood Heath. In other cases events could definately produce results which could cause injury to the crews and the trains they were working. Such was the case on August 6th 1970 when the 8.20 Birmingham - Paddington hit a farm tractor/trailer laden with hay near Fenny Compton. The locomotive, 1745 sustained cab damage and was noted with the cab sheeted over being hauled to Tyseley on 8th behind 7640, en route to Crewe Works. Disruption to normal working was also prevalent during times of 'work-to rule' and strikes. During February 1974 ASLEF action caused disruption of various sorts. Paddington continued to receive visits from Peaks on services from the West, Bristol & surprisingly Birmingham, on 13th 45013 arrived on a mid-afternoon service, returning on the 17.40 to Birmingham. And then of course there was just the plain weird when motive power shortages sent locomotives over routes not normally travelled by them. For instance 73109 reached Banbury on September 15th 1981 with a special Eastleigh – Warrington freight, 25284 & 25285 took the freight northward. On April 26th the Bescot breakdown crane became derailed whilst crossing Leamington Junction, the Saltley crane arrived later in the morning behind 25293, by afternoon the offending vehicles had been rerailed and taken away. Leamington Spa and the surrounding towns of Warwick, Kenilworth and Coventry had a large enough catchment area to support the running of Day Excursions - Merrymakers as I used to know them. Saltley and Bescot could always be guaranteed to turn out a local Class 47 for such workings, especially if it were to be an inter-regional job. However during their heyday in the mid 1970's the Class 25's were frequently diagrammed for day excursions, particularly those that would remain within the LMR boundaries. Samples of these are detailed below as well as some others. When the Class 25's were allocated to Laira it was common to find day excursions to Devon being worked throughout by the Type 2's. April 15th 1974 found 25074 & 25075 making a trip to the sea-side, being in charge of a Leamington Spa – Paignton excursion. On July 25th 1974 25299 & 25305 were in charge of a Leamington Spa – Morpeth troop special. A Leamington – Aberystwyth senior citizens special on June 16th 1975 ran throughout behind 25054 & 25120. August 6th 1975 found a Banbury/Leamington – Barmouth special in the hands of 24085 & 24143 working throughout. June 3rd 1976 saw a Leamington – Aberystwyth excursion behind 25055 & 25264. On the return working the latter failed at Upton Magna, both being replaced by 47488. 25049 Leamington Spa down excursion March 1976. The Leamington/Coventry area started their 1976 holiday week on July 11th and featured amongst others 25038 & 25145 to Rhyl (21st), 25073 & 25074 to Aberystwyth (23rd). A number of Easter excursions ran from Leamington during 1977, the only Type 2’s used were 25039 & 25042 to Aberystwyth. A pair of Class 25's, Leamington Spa 1979. On August 17th 1981 an excursion from Banbury to Aberystwyth used 25242 & 25268 throughout. The arrival at Banbury of a partially failed 47053 in charge of August 15th’s 1981 07.40 Newcastle – Poole relief sent 25285 on an adventure to the SR, assisting to Eastleigh, where both were replaced by 33109. On September 18th 1981 25248 assisted the dmu working the 15.50 Banbury – Marylebone. Locomotive failures were another means of getting locomotives to places they wouldn't normally be found at. For workings through Leamington Spa perhaps the most unusual destinations that the Class 25's might end up at would be Paddington or somewhere down on the Southern Region beyond Basingstoke. Old Oak crews were not trained on Class 25's so their arrival at Paddington usually meant they had to return as soon as possible northwards, otherwise it meant stranding the locomotive until means could be found to return it to the LMR! On January 21st 1969 7666 reached Paddington with the 07.35 from Oxford after the booked locomotive, 1925 had failed. The Class 25 was manned by a Bletchley crew with a WR pilot, seven minutes were lost on the journey, final arrival was thirty five minutes late. Class 47/52's were expected motive power for the Birmingham - Paddington turns, however on February 8th 1970 the 9.40 Birmingham New Street - Paddington was in charge of Toton’s 93, the locomotive coming back with the 17.05 to New Street. The 14.25 Birmingham – Paddington on July 16th 1975 was taken over by 25267 & 25269 following the failure of the rostered locomotive. These machines then returned with the 17.40 to Birmingham, not the normal way the diagram worked but necessary due to the lack of crews at Paddington familiar with the Class 25’s. The 11.05 Paddington – Birmingham and its return working was handled by 45064 on April 23rd 1977. When an afternoon Manchester – Paddington service failed at Coventry on October 13th 1979 the nearest help was 25248 & 25305 which worked all the way to Paddington. They returned north on the 19.00 Paddington – Manchester! On June 12th 1982 25145 clearly had an adventure when it worked the 08.35 Birmingham – Paddington returning with the 12.50 Paddington – Liverpool. Six weeks later on July 31st 25279 worked the 08.35 Birmingham – Paddington and 12.50 return Liverpool working, going as far as New Street, a fire having incapacitated the booked Class 50. And on October 2nd 25044 was in charge of 08.35 Birmingham – Paddington! It returned from the capital in charge of either the 12.50 or 17.41 service to Birmingham. This route was something of a backwater for dead engine movements until Swindon Works took on an increasing role in the scrapping of BR's aging diesel fleet. Whilst not seeing as much activity as the Birmingham - Cheltenham route it did have some notable machines make their last journies over it. On February 15th 1976 the 9X45 04.38 Reddish – Crewe – Banbury – Swindon special freight took 24005/20/21/24 to their appointment with the scrapper. Included in this consist was of course the first built Class 24 which by April would be just so much scrap. Several movements of retired locomotives passed through Oxford during the third week of November 1980, of note on 16th was 25001 towing 25013/21/19 & 31274 as the 07.20 York – Swindon Work. Our journey over the line begins at Saltley, one of the depots that would provide much of the power featured on this page, in particular the Class 25's for the freight, parcels and permanent way duties. To reach the line to Banbury the southbound trains would ignore the right hand curve which would take the trains off the Derby line towards New Street. Instead they would continue in a southerly direction, heading under the Birmingham - Coventry line, and quickly joined by the line coming in from New Street. The line would now be in a cutting in the district of Bordesley, passing the Birmingham City football ground on the east side of the line. After leaving the cutting a line to the left brought the traveller onto the former GWR route from Paddington to Snow Hill. From this point the line heads in a south-easterly direction through the suburbs of Birmingham, out to Solihull and on towards Leamington. 25129 heads south past Saltley with a local freight to Bordesley during April 1980. In the background is 45015. A Class 25 heads south sometime during 1982. A Class 25 heads south sometime during 1982 with a parcels working from Curzon Street. Its 25084's turn to be the Camp Hill banker, seen here during July 1982 with the route set for a return to Saltley or Washwood Heath. At Hatton the line encounters a challenge for northbound workings, that of Hatton Bank. The nearby Grand Union Canal requires twenty one locks to deal with this. As the line approaches Leamington Spa it is joined by the branch from Coventry. Southbound on the up fast. On a damp day during February 1980 45110 comes off the Coventry line, presumably with a diverted southbound WCML service. Long time Toton allocated no-boilered 47361 heads north through Leamington Spa during the summer of 1981. The line leaves Leamington Spa on a viaduct, curving to the south east and taking the route out of the city. Whitnash marks the southern limit of Leamington Spa, the transition from city to countryside. 25261 near Whitnash with an Up ballast during June 1977. Fosse Way, the ancient Roman road that travels a NE/SW route across the Midlands is crossed by the line south of Whitnash as it makes a broad sweeping curve to the south east. 25277 with an empty ballast working at Fosse Road on December 8th 1975. Approaching Harbury the line enters a curving deep cutting. The line reached here in 1852, the cutting being another silent monument to the Victorians ability to reshape the landscape. When completed the cutting was the deepest in the world. The excavated soil and rock was dumped to the south east of the tunnel. It now produces a unique combination of flora & fauna, it's become a protected area 'of special scientific interest' and is aptly known as the Harbury spoilbank. 25039 at Harbury northbound with a parcels working sometime during January 1978. 25257 leaves Harbury Tunnel with a short freight during June 1982. Harbury Cutting on August 16th 1975 with 25142 & 25253 with a long train of continuously welded rail. In contrast to the summer view at Harbury Cutting above, here is winter's version, sometime in 1980 with a good covering of snow on the ground as an unidentified Class 45 heads north. In recent years the area around the north end of the tunnel has become unstable. Remedial work to combat the landslips has somewhat altered the scenery. Once clear of the lengthy cutting the line approaches Bishop's Itchington, the location of a rail connected cement works. Its Bishop's Itchington on the map but BR know it as Greaves Siding because the Blue Circle cement plant here was known as Greaves Works. Originally the plant manufactured cement from raw materials, when this became uneconomic in the early 1970's, the works was retained as a regional distribution center for a futher decade or so. Cement was brought in from Northfleet, then later on from Hope. Looks like a cool winter's day as 25187 heads south past Bishop's Itchington with a loaded ballast train. Just visible in the background is the Blue Circle cement plant. 25194 heads north with oil tanks past the cement plant during the summer of 1981. The Blue Circle plant at Greaves Siding operated a Sentinel 4wdh of 1959 vintage. It is seen here on May 4th 1985. An overcast December 5th 1975 finds 33024 working north through Bishop Itchington with the Fawley - Bromford Bridge bitumen tanks. This working regularly brought Class 33's to the Birmingham area, normally those allocated to Eastleigh and frequently operating in pairs. The above view brings back afew memories - the first Class 33's your webmaster saw were at Bromford Bridge on the Fawley workings. Summer holidays and Midland Railtourer tickets meant frequent trips to Birmingham and it was on the morning runs from Derby that we frequently passed by pairs of Class 33's at the Bromford Bridge oil terminal. Hastily snapped shots of these workings have survived the test of time, no matter how poor the actual print turned out, the memories they revive seem like it was only yesterday! Andy also remembers these workings, in particular the sound of them as they roared through Leamington on the loaded northbound workings. These were mostly solid Eastleigh based locomotives, predominantly 33/0's but occasionally 33/1's would turn up. Hither Green based examples would show up from time to time. Another regular Class 33 freight turn over this route was an Eastleigh - Bescot freight, though this and its balancing working generally passed through Leamington at night. Class 33's would also show up on the passenger services, either deputising for a failure or the non-availability of a locomotive at Reading. Others turned up on specials, one Saturday morning whilst ensconced in Leamington buffet an FA Cup Tie football special rolled in comprised of 2 x 4TC and 1 x 3TC with two Class 33's on the rear, working from Southampton to Birmingham. The buffet was vacated very smartly to watch this train roll by. The game ended up twice drawn, we eagerly awaited further specials afew weeks later, alas they were routed via the WCML! Fenny Compton is about midway between Leamington Spa and Banbury. It is also the junction for the branch to the MOD facility at Kineton, a working with which the Class 25's were very familiar. This line used to run through to Stratford on Avon as part of the Stratford & Midland Junction Railway. When open as a through route it was used by iron ore workings from Banbury destined for furnaces in the Cardiff area. At Fenny Compton the railway and the Oxford Canal run side by side for a short while. Its January 1981 as 25275 approaches Fenny Compton from the south with a lengthy train of vans bound for Kineton. Two views of 25248 at Fenny Compton during July 1982. From this point the lines runs a southerly course until it reaches Banbury. Banbury for the moment marks the end of our story, although for the Class 25's they would be frequent visitors beyond Banbury, mostly going on to Oxford or Reading. Some would venture all the way to Paddington whilst others would visit Basingstoke and Eastleigh - with the occasional working even farther west to Bournemouth - but thats definately another story. Its a full house at Banbury during the summer of 1982. The stabling point holds a Class 08 & 33 whilst 25141 stands ready with a train of empty wagons. On the right the unmistakeable 47484 gets ready to head north. Up until the 1960's Banbury had a vast yard needed because of the link to the GCR at Woodford Halse. The yard was ideal for sorting traffic, there were at one time three routes northwards and two to the south. As time marched on and routes were rationalised the yard shrunk, leaving only a few sidings to service the cement trains to Bishops Itchington and MOD traffic to Kineton. Banbury Yard is now closed. 25268 at Banbury Yard during January 1981. To the right is 08784 Cherwell whilst 45071 to the left awaits the arrival of its driver. 25141 approaches the remnants of Banbury Yard during August 1982, getting ready to work the afternoon class 9 trip to Bescot. If we backtrack to Leamington and also travel back afew years it would have been possible to travel from Leamington to Daventry & Weedon, or to Rugby or Nuneaton via ex-LNWR metals. Rationalisation in the late 1950's saw the service to Weedon withdrawn in September 1958, nine months later the service to Rugby was discontinued whilst Nuneaton lost its service to Leamington during January 1965. At the time the Weedon - Leamington line lost its passenger traffic the line was still used by three daily goods trains from the Weedon end and a daily pick-up freight. Perhaps the most significant source of traffic on the line was the chalk traffic generated by the plant at Southam. Thoughts at the time indicated that since most goods traffic was coming from the Weedon end of the line that it would be logical to close the section north from Southam to Marton Junction. History however would see this plan changed, the chalk traffic would continue, not through Weedon, but via Rugby with a reversal at Marton Junction. The views below are from the spring of 1982 and feature 25265 on one of these workings with the views taken at Marton Junction showing the reversal. 25265 and train at Marton Junction. The Class 25 has just run round its train and is about to head up the branch to Southam. A weak sun catches the Class 25 and its train at Marton Junction. The train is facing in the Rugby direction, but the points in the right foreground are set for the line to Southam. A view from the cab of the Class 25 at Marton Junction. The locomotive is heading westwards in the direction of Leamington, the line coming in from the right is from Rugby. The metal structure carries the Honingham Hill road over the cutting. The photographer knew the branch reasonably well and when a colleague mentioned he was looking for some unusual photo opportunities the branch seemed an obvious choice. The branch wasn't heavily used and traffic most likely ran on as required basis, possibly with a daily trip working. It operated under one engine in steam and the token was kept in the yard at Rugby according to the Sectional Appendices to the WTT. As usual there were a couple of fruitless trips but one day after a lunchtime pint in the "Blue Lias" pub which was adjacent to the headshunt, at the very extreme end of the branch we could hear a Class 25 ticking away. We boldly made our way to the lineside, it wasn't difficult in this remote outpost of Warwickshire, several of the photographs above were the result, depicting the Class 25 standing at the front of a rake of 16ton vacuum fitted wagons. The vacuum fitted wagons were necessary on the branch because of the odd layout at Marton which required a complete reversal. The presence of a brake van would have complicated matters unless one were at each end. We politely enquired of the driver (there was a secondman & a shunter too!) if there was any chance of a trip up to Marton Junction from the cement works. The request at first was declined but on learning that my friend had travelled many miles to view this working, the driver relented and we climbed aboard. We got off at the junction and walked back to our cars which were still in the pub car park, I think it was about a three mile walk! We had a couple more trips and got to know the crews quite well. On one occaison the old lag of a Rugby driver was not in the mood for conversation so drove from the wrong end and left me and my friend in the lead cab on our own! Can you imagine that today!! The traffic down the branch was quite interesting, there was coal off the Coventry - Nuneaton line, Gypsum from East Leake, which presumably worked into Loughborough off the spur onto the former Great Central, in itself quite a journey! Additionally some Presfloes were used to carry bulk cement. There was a full-time works shunter at Long Itchington. BR lost the contract to haul chalk to the Southam cement plant on August 1st 1985, resulting in the line being lifted the following year. An unidentified Class 25 at Long Itchington yard, opposite Southam Cement Works. The notes below and the photographs have been graciously provided by Ron Kosys from a trip made on June 20th 1985 to watch a weedkiller work down to Southam. The line through to Southam had already seen its last commercial traffic and had completely rusted over. The weekly notice had a schedule published for the weedkiller - it was reprint of the schedule for the previous year's visit. Surely it wouldn't traverse the branch??? Well, it did. It crawled all the way, stopping at least once at Bilton to remove a mattress that had been thrown onto the disused line from an overbridge. We beat it to Marton Junction by a good 20 minutes, including the run of over half a mile from the road...a word with the driver regarding Long Itchington - would you mind waiting for us so could photograph it off the then A423? As it happened, we beat it with ease to the bridge - the driver crawled roound the corner, a wave confirmed we had made it to the bridge and he eased his way towards us. From the state of the track in the photographs you can understand why. The driver took the train right to the buffer stops at Marton itself. We thought this was the last train down the branch, but I am assured that a DMU went down a little later on an Inspection special. For those of us with minimal pocket money or a part-time job (newspaper round or whatever) the use of these scarce funds for the purchase of railway tickets required a great deal of thought. Fortunately the LMR had two tickets which provided great value for money back in the 1970's. One was the Midland Railtourer ticket and the other the East Midlands Ranger ticket - both provided seven days of travel over an area that was criss-crossed by quite afew lines, with the tickets having few restrictions. Whilst using a Midlands Railtourer ticket, the date now long forgotten, we were homebound and were waiting at Birmingham New Street to pick up a service back to Leamington. 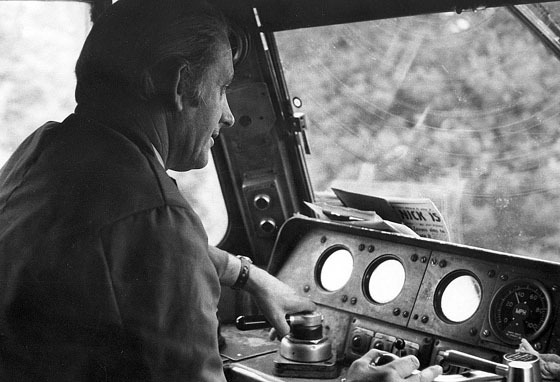 Our train home turned up with a Class 47 on the front, so we went up to the driver to ask to cab the locomotive. He declined, we walked away somewhat deflated, but the driver then called out 'come up to the cab at Solihull'! Which we did and joined the driver to cab the locomotive and remained in the cab for the run into Leamington. Apart from Hatton Bank our route was all uphill, so us two teenagers got a basinfull of a Class 47 under power. The driver went about his driving unfazed by his two guests, probably not aware of the impact this short ride was having on us! The business end of the Class 47, the mobile office and home away from home for most drivers on BR at one time or another, complete with its streaky windscreen, newspapers and working notices. Also thanks to Paul Appleby and the RailPhotoArchive (RPA) site which hosts many, many more of Andy Hoare's excellent views.